More than half of India is strictly ﻿vegetarian.﻿ Generally, Hindus are vegetarian by nature and because of their religious believes to save the lives of animals, they have integrated several techniques, spices and vegetables to enjoy tasty and healthy meal. In daily life most Indians eat vegetarian meals. Non vegetarian meal is eaten occasionally as a treat. Therefore it is natural that India grows the finest assortment of vegetables in the world. Indian food will never be boring because it is cooked with so many different ways and with so many different combinations of seasoning and vegetables that one can never get tired of them. Most of the Indian cooking not only has vegetables but lentils, fruits, beans, legumes, and sprouts as well. Vegetarian Indian cuisines are considered the healthiest since the vegetables and the fruits that they use have low calorie. Almost all Indian vegetables dishes begin the cooking process the same way by heating the cooking oil with spices and frying the onions. I find that if you go light on oil it would not change the flavor of the spices or the vegetables this is the reason I have try to use nonstick pan for cooking. Nonstick pan require less oil for frying the onions. These vegetable recipes are the way they are cooked in north Indian households. 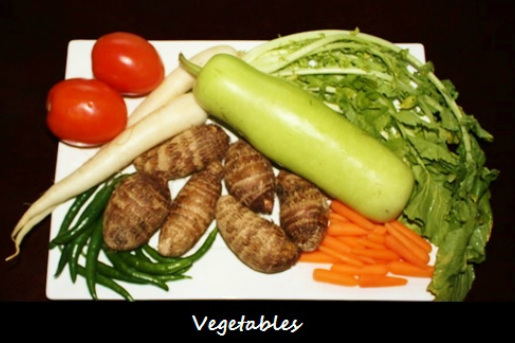 You will find same vegetable cooked in many different ways to produce a variety of different flavors. Each dish is separate in texture, form and appearance and can truly be said to be individual. Try these recipes and experiment and adjust the spices according to your preference. Please take the time to let me know what you think about my popular North Indian vegetable dishes recipes. Your comments would be helpful to me to improve the recipes.